McGuire Harley-Davidson/Buell has a sleek, 34,000 sq. ft. showroom and service facility in Walnut Creek, CA. It has been an authorized Harley dealer for over 45 years. The first floor is a spacious dealership and service center, and the second a busy retail shop. For years, their fluid handling system consisted of four 55-gallon drums with air pumps that stored 20/50 and 50 wt. Motor oils, chain lube, and transmission oil in an 8 x 8 ft. square section of the service area. This was not as efficient as the dealership would have liked, according to owner Mike McGuire. With this method, a technician would open the drum lid and insert a hose to transfer the lubricants through ceiling mounted hoses on reels. Throughout the day, service technicians would pull these 50 ft. long hoses down to their work area. Waste oil drums were positioned under the nozzle to catch some of the leakage from the hanging hoses, yet most leakage occurred when the hoses were pulled down and recoiled back into the ceiling. Screw caps placed on the nozzles wore out and often fell off, leaving oil splatters on the floor. The bottom line was that McGuire Harley-Davidson/Buell needed to eliminate drum storage of the lubricants used in its daily operations and find a better alternative. They had heard about a storage and dispending system from Innovative Fluid Handling Systems in Rock Falls, IL, through one of the service people who had used one of the Systems at a previous job. McGuire Harley-Davidson/Buell got in touch with the IFH Group in Rock Falls, IL. 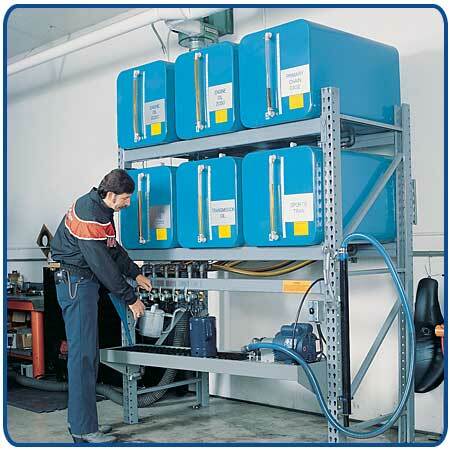 IFH listened to their requirements and delivered a customized Storage and Dispensing System with a six-container arrangement that allowed them to double up on the two most frequently used motor oils, with one container each for the chain lube and transmission oil. The IFH System and its 65 Gallon Containers allow the service technicians to pump 55 gal. worth of product into each of the overhead containers well before the product runs out. The containers and faucets are clearly labeled so there is no chance of the wrong product being used, and with its highly visible sight gauges, the IFH System quickly eliminated the inventory guessing game. By eliminating drum storage with the IFH System, McGuire Harley-Davidson/Buell reduced floor space by nearly half. Also, there was no more drum tipping or cleaning, no switching or replacing drum pumps, and no more drum deposits. Self-closing faucets and timer shut-off make cleanup quick and easy, and the system required minimal operator supervision. For McGuire Harley-Davidson/Buell, installing this improved fluid handling system to eliminate drum storage has resulted in better inventory control, reduced product waste, improved safety, and a cleaner and more efficient workplace. With its modern, more upscale appeal, Harley’s new image has changed the way dealers like McGuire Harley-Davidson/Buell do business, and products like the IFH Storage and Dispensing System have played a major role.